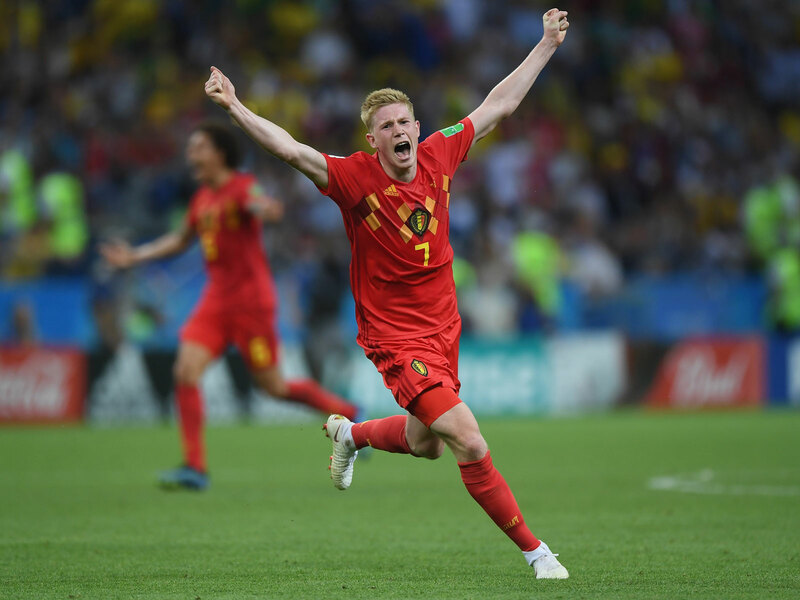 Belgium's star-laden Red Devils took Brazil by storm with a tactical masterstroke and a first-half counterattack, then possessed the nous to fight off a mighty rally, booking the nation's first World Cup semifinal place in 32 years. KAZAN, Russia – With seconds remaining, the ball came to Neymar in space, 20 yards out. Belgium led 2-1, but it was shot, its players exhausted, too drained by that stage to make even the vaguest effort at a counterattack. If the game had gone to extra time, there was only going to be one winner, and it was donning yellow and blue. Neymar, who had been involved only fitfully, picked his spot and unleashed a curler. Perhaps it could have been a fraction closer to the post, but as his shot arced goalwards, Thibaut Courtois, who had already made a string of fine saves, jumped up to his left, extended a long black-sleeved arm, and, with his long black-gloved fingers, flicked the ball over the bar. In context, it was a stunning save. Courtois bounced to his feet, clenched his fist and roared. There was still time left, still theoretically a chance for a Brazil equalizer, but at that moment the game was won, and Belgium was on its way to a first World Cup semifinal in 32 years. Belgium had been left clinging on. For much of the second half it had withstood a siege. Courtois was magnificent. So was Vincent Kompany in front of him and so, perhaps more surprisingly, was Marouane Fellaini, the much-derided Manchester United midfielder, a bag of elbows who battled ferociously and played with great positional intelligence. The second half was about effort and desire and throwing bodies in the way. The first had been rather different, a test less of courage and resolve than of ability. By the end of his career at Everton, Roberto Martinez was almost derided as a manager who couldn’t organize a defense, whose ideas failed in the same way over and over. Yet here he sprang a major tactical surprise. Out went the back three, in came Fellaini and Nacer Chadli, heroes of the comeback against Japan in the last round, and the shape became a 4-3-3 with Kevin De Bruyne as a false nine. It was an undoubted tactical triumph. “When you play against Brazil, you have to get a tactical advantage,” Martinez said. “We had to be brave tactically. The players have to believe. It was about the execution of the tactics. We had to be compact, we had to stop Neymar and Coutinho and the runs of Paulinho. Brazil, in the first half, had no answer for De Bruyne. As he pulled deep there was nobody to pick him up and as the great puppet-master he pulled strings without interference. Starting wide and given encouragement to cut infield, Eden Hazard and Romelu Lukaku kept finding space. Both, in their different styles, terrified Brazil with their direct running. It was Hazard who was the architect if the first goal, his precise pass releasing Lukaku, who won a corner. Chadli took it, and Kompany couldn’t quite get there. But two of his Manchester City clubmates, Gabriel Jesus and Fernandinho, jumping just behind him at the near post, did, and the ball was deflected in off the latter to give Belgium a 13th-minute lead. Perhaps there was good fortune for Belgium then, as there had been when Thiago Silva bundled an effort against the post from an early corner, and Paulinho missed his kick in front of goal. But what followed was a masterclass in the art of the counterattack, most of them orchestrated by De Bruyne. He, though, was the recipient of a counter to score the second after 31 minutes. Lukaku’s charge took him by Fernandinho and Paulinho before he laid the ball right to De Bruyne. There was still plenty to do, but he has shown often enough over his career his ability to strike the ball with great accuracy and power from outside the box. Here, he unerringly picked out the bottom corner. This, Martinez said, “is the game of the World Cup whatever happens. Psychologically, against Brazil you have to play well and believe.” That may be true, but that may also represent the biggest danger for Belgium as it looks to pick itself up after such an epic game–two epic games, really, considering the exertion in coming back to beat Japan–to go again. But even if France is too much to overcome in the semifinal, this is the most golden Belgium's golden generation has ever looked.